The last catfish stocking of the spring season will take place the week of June 10-15 at all Phoenix and Tucson area urban waters. Fishing is good to excellent for anglers using worms, stink baits, hot dogs or shrimp fished on the bottom. Catfish are biting irregularly throughout the day, but are more active when the sun goes down. Most catfish are from 15-17 inches, but some lunkers over three pounds are being hauled out of the lakes. 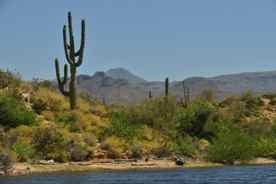 Sahuarita Lake south of Tucson will not be stocked with catfish in June due to lowered lake water levels for maintenance and inspection activities. Bluegill fishing is good for anglers using worms and mealworms fished under a small bobber in 3-6 foot depths. Action for largemouth bass is fair with the best baits finesse plastics fished in the early morning hours. At Green Valley lakes (Payson) fishing for trout is slowing down since stockings wrapped up on May 10. However, fishing for bass, bluegill and crappie is good. Anglers using worms and meal worms under a small bobber are enjoying plenty of action. Also try small curly tail grubs or marabou jigs. The spring catfish stocking season, that includes seven deliveries of fish every other week, will end with the final stocking the week of June 10-15. Every stocking, 14,000 pounds of channel catfish are delivered from Arkansas to the 20 Urban Fishing Program waters in the Phoenix and Tucson areas. Coming from fish ponds in Arkansas, our fish suppliers log thousands of miles on their large rigs to truck catfish into our park lakes during the spring stocking season. Warming lake temperatures and air temperatures make it impractical to haul live fish into Arizona's Urban Lakes and Ponds during the heat of the summer. Consequently, there are no scheduled fish stockings for July, August, and the first half of September. Catfish stockings will resume again in mid-September when lake and air temperatures cool enough to safely transport fish across the hot desert and into the Urban waters. Anglers can still enjoy fishing for catfish, bass and bluegill at Urban waters throughout the summer, but the action is generally slower.